If you are looking to replace your amalgam (silver) fillings with tooth coloured (white fillings), or have your tooth repaired with a white filling, then at Castelnau Dentists, our highly qualified and experienced team are here to help. 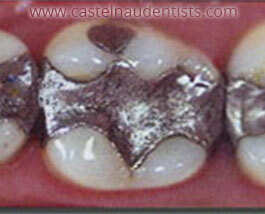 White or tooth coloured fillings provide a natural-looking alternative to traditional amalgam fillings. Available in a wide range of shades and opacities, white fillings can be used in the front or the back of the mouth and can be designed to blend into the rest of your smile. Our dentists have years of training and experience, and will be able to recommend the right shade so that your white filling will match the natural colour of your tooth. In the front of the mouth, white fillings can also offer a great way to build up cracked or chipped teeth to restore teeth to their original shape, as well as to close gaps and reshape uneven or short teeth. 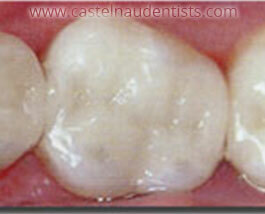 At Castelnau Dentists our white fillings are available in a wide range of shades and opacities. Our team of highly trained dental professionals are able to build up white fillings through a complex 'layering technique' to create perfect, yet invisible, restorations that blend into the rest of your smile. In the back of the mouth, white fillings are the ideal, natural-looking way, to repair cavities and to restore the strength and function to teeth that have been damaged by decay. They also allow for a minimally invasive restoration meaning more of your natural tooth can be preserved compared to traditonal amalgam fillings. Traditional amalgam fillings contain a mixture of silver, tin, copper and mercury making them strong, durable and ideal for the back teeth that are less visible. A white filling, which starts off life as a softer and easier material for our dentists to shape and mould, is far more effective in repairing chipped teeth or restoring decayed teeth in the more visible part of your smile and the front of your mouth. Once moulded to the desired shape, a blue light is then shone on the white filling to harden it and to fix it into it's final shape.